The Mint scent soothes while eliminating odors on a dog's coat through cutting edge photo catalytic science. We developed this advanced mineral based solution that's safe, natural and soothing for your dog. 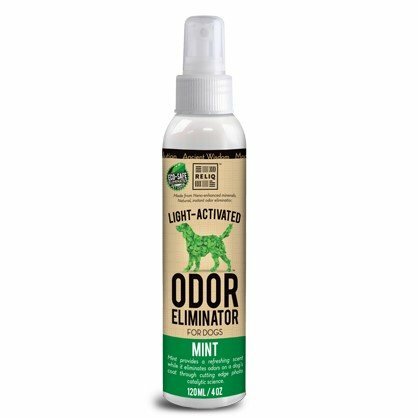 This natural, but powerful odor eliminator will safely and effectively remove odors from your dog and everything your dog touches. INSTANT ODOR BUSTERRELIQ Nano-enhanced minerals break through the bonds of odor molecules and dissolves them on contact. PERFECT FOR INDOORS OR OUTSpray on dogs' coats or paws as they enter or exit the house, car or kennel. USE AFTER AND IN-BETWEEN BATHS After bathing, apply to damp coat before drying, or apply anytime between bathing for a clean and fresh scent! Also safe for use on upholstery bedding or any surfaces.PH = 7.0 PET FRIENDLY No harsh residual and lick safe, our natural pH7 deodorant is uniquely balanced for dogs. If you have any questions about this product by RELIQ, contact us by completing and submitting the form below. If you are looking for a specif part number, please include it with your message.